We have seen Fujitsu MCM Pentiums before. 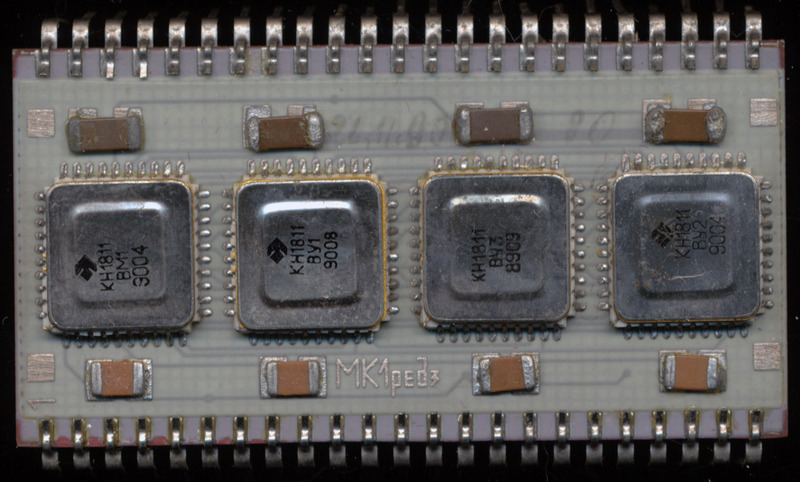 120MHz, 133MHz 150MHz and MMX ones. 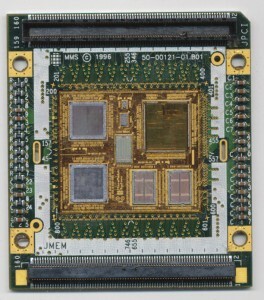 One is pictured in the article on the MicroModule Systems Gemini here. 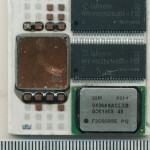 The 100MHz module is similar, though it is missing the L2 cache tag RAM (256 kbit chip on the top of the package) as well as the 2 cache RAM chips normally installed on the backside of the module. It would appear that Fujitsu offered these modules with the cache being optional. 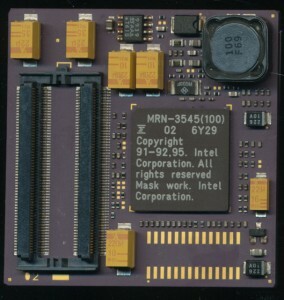 There was a 133MHz version (MRN-3548) with cache, and one (MRN-3549) without cache. 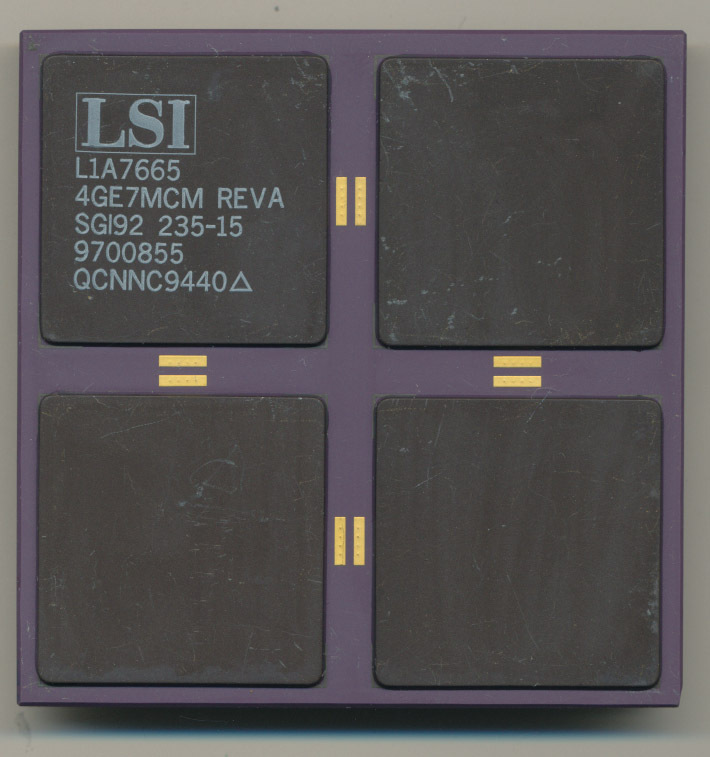 These processors were typically used in environmentally challenging environments. Panasonic famously used them in their ToughBook CF25, the beginning of a line of highly durable laptop in 1996. 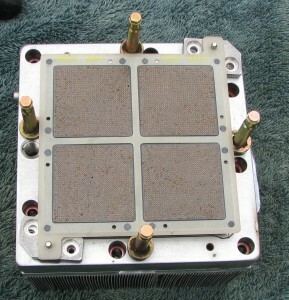 Some of these applications were sealed environments, they did not have vents, or active cooling. This obviously makes cooling a challenge. 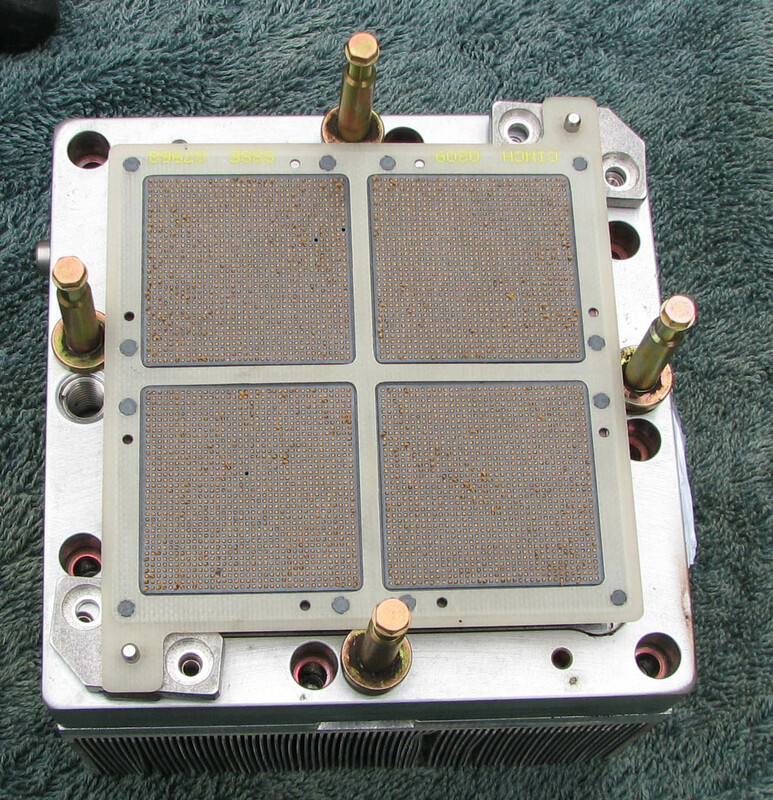 Removing the L2 cache, while causing a significant hit in performance, would alleviate some of the heat generation. 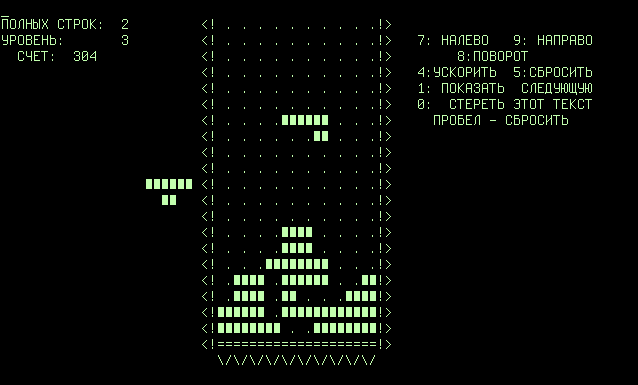 Mainframes are the workhorses of the computing industry. They process transactions for about every industry, and handle the brunt of the economy. Their MTBF (Mean Time Between Failures) is measured in decades (typically 20-50 years). 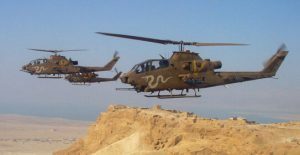 A comparison to a home computer is hard to make, they are in an entirely different league, playing an entirely different game. Mainframe processors such as these work in what is referred to as ‘Data Intensive’ computing environments. 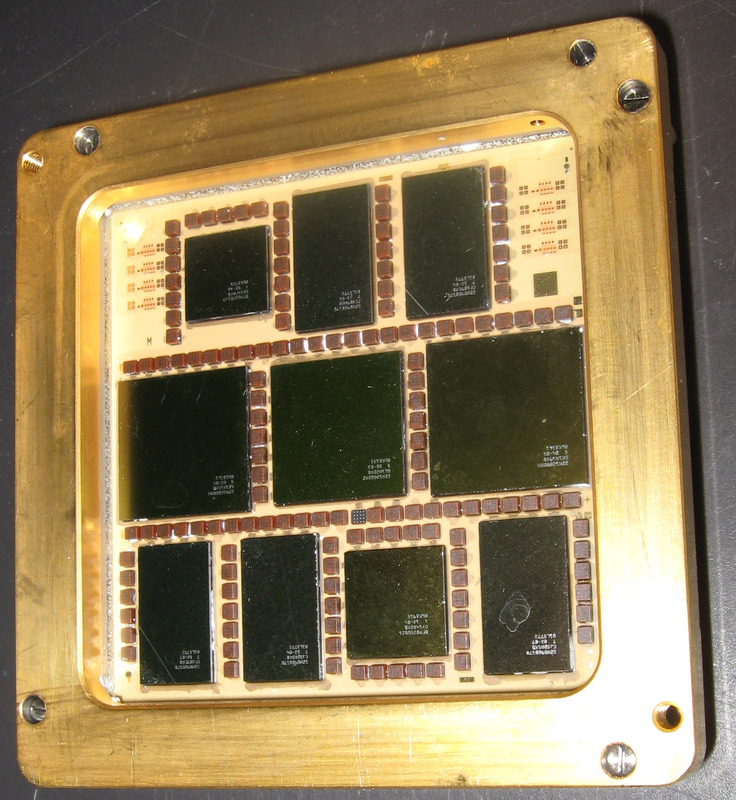 This is different from multi-cored processing that focuses on ‘CPU Intensive’ computing. 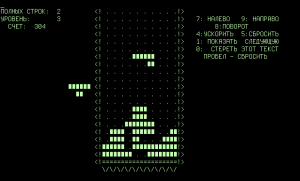 CPU intense has a relatively small data set, but most perform a lot of work on that set of data, or do the same instruction on a set of data (such as graphics). 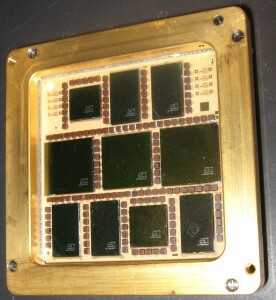 CPU Intense processing can often be sped up with the addition of more processing cores. Data Intense processing does not see as much benefit from adding cores. Its biggest bottleneck is accessing the data, thus the System z tends to have VERY large caches, and very high bandwidth memory. They typically operate on transactional type data, where the processing has to operate in a certain order (A has to be done before B which has to finish before C etc). 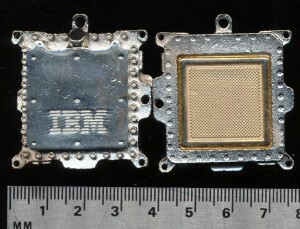 IBM was one of the first, and continues to be one of the largest suppliers of such systems. Starting with the System/360 introduced in 1964 to the zSeries today. The zSeries was first launched in 2000 with the z900, a significant upgrade from the System/390. Data addressing was moved to 64-bits (from 31 bits) yet backwards compatibility (all the way back to the 360) is maintained. 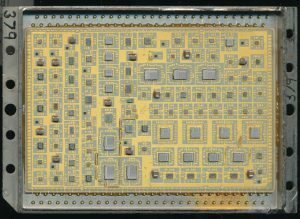 The z900 ran at 775MHz and was built with a 35 die MCM containing 20 Processing Units (PUs) and 32MB of L2 Cache. 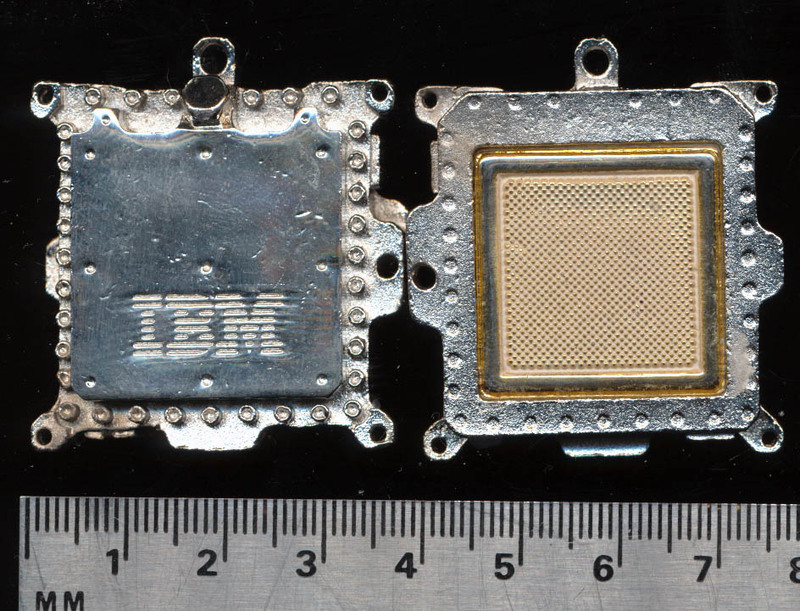 CPU of the Day: Unknown IBM MCM – Any ideas? Every now and then I will get a chip in that I cannot ID. This is a particularly perplexing one. It looks like it should be something fairly well known, but I cannot determine what. 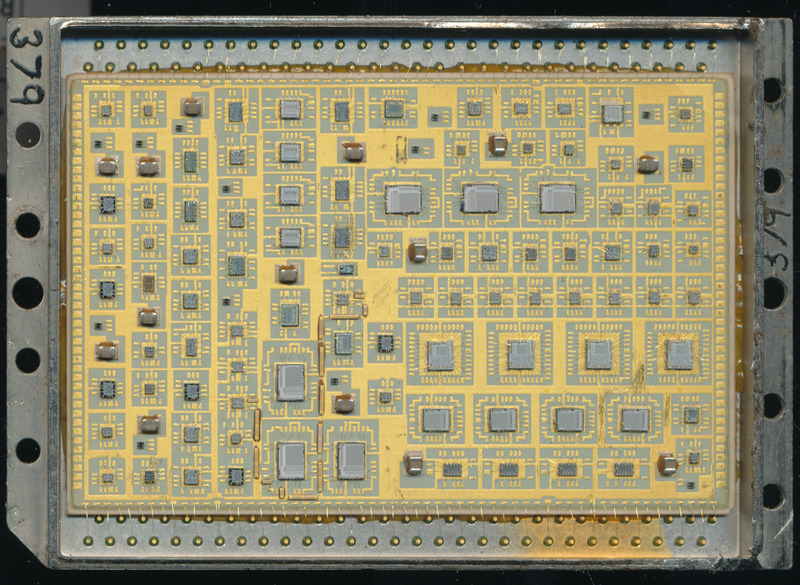 By the dates its a 2005 vintage IBM, MCM, on a fairly large ceramic package with 1077 lands. 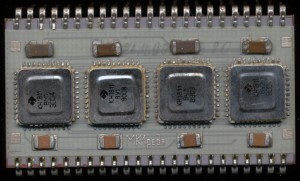 It contains a pair of Infineon HYB39S256160DT-7 256Mbit (4Mbitx16bit) DRAMs which are 7ns 143MHz max, commonly used on PC133 SDRAM. That works out to 64MB. 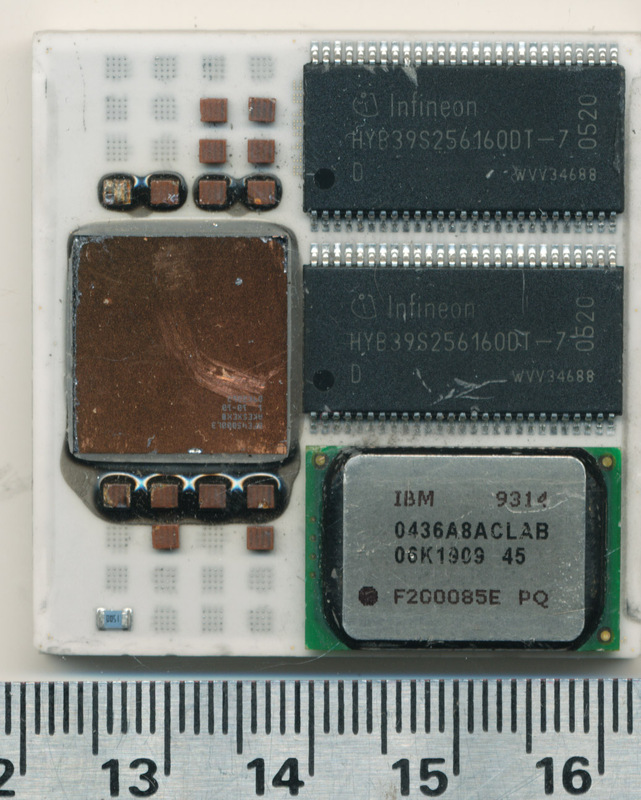 Also on the package is a IBM0436A8ACLAB 8Mbit (256Kx36) 4.5ns (222MHz) 1Mbyte SRAM. 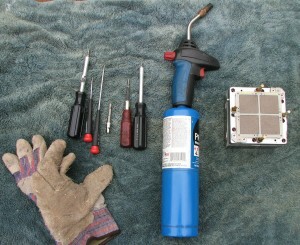 If you have any ideas what it is, or what it may be, post a comment. I may just give you one. These came in with a lot of HP PA-RISC processors, so perhaps related? 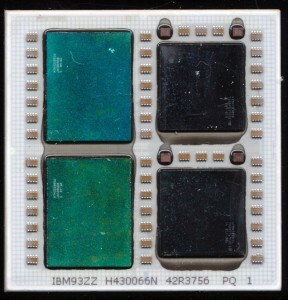 MicroModule Systems (MMS) began operations in 1992, following the completion of an agreement to acquire the assets and license rights to the technology of Digital Equipment Corporation’s MCM (Multi-chip Module) engineering and manufacturing business in Cupertino, California. 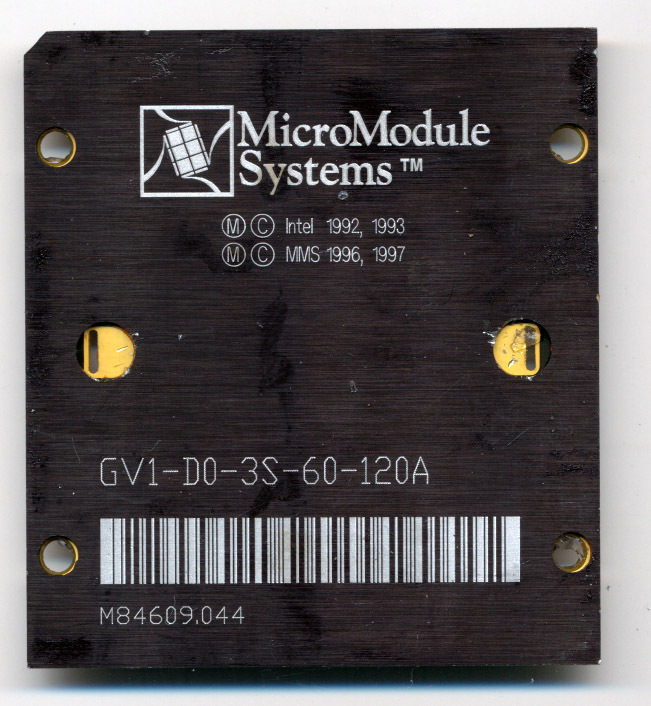 The MicroModule Systems vision was to lead the next wave of electronic integration technology. 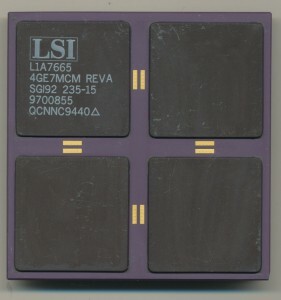 Previous waves have been: discrete components (1950s), integrated circuits (1960s), large-scale integration (1980s), and system on a chip (mid 1990s). 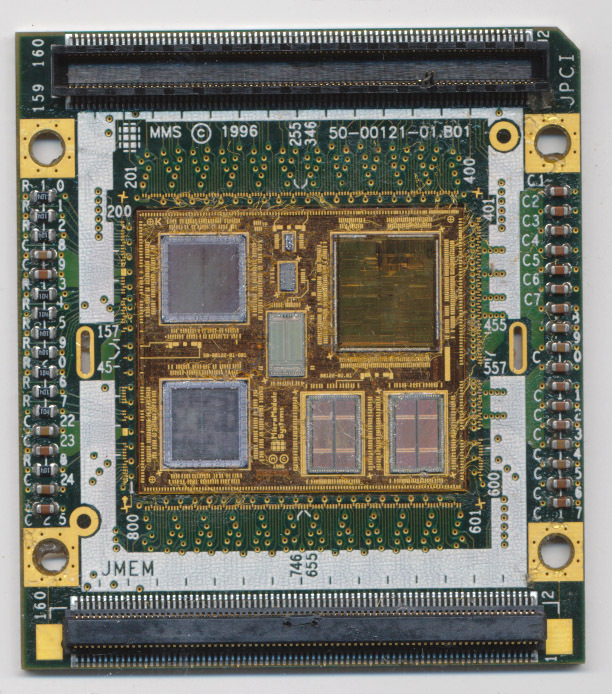 The MMS Gemini was a module, that includes the National Semiconductor chipset die (x2) , a P54CSLM Pentium die, tag RAM, and cache RAM (128Kx2) as well as an LM75A temperature sensor for thermal management. 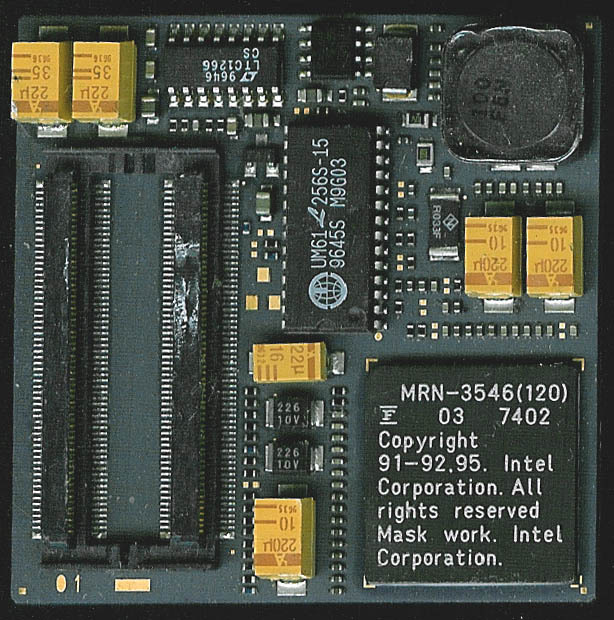 MMS used Intel D0 revision P54 processors (with the exception of some early C0 die), a stepping Intel never packaged themselves (it was solely used for the ‘known good die’ program). 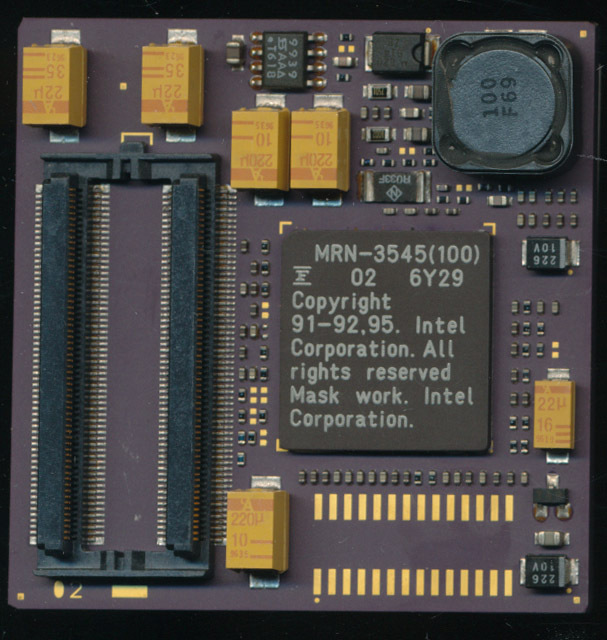 When Intel discontinued selling fully tested dies, MMS had no way to build the Gemini and later MMX modules, so in 1998 went out of business. 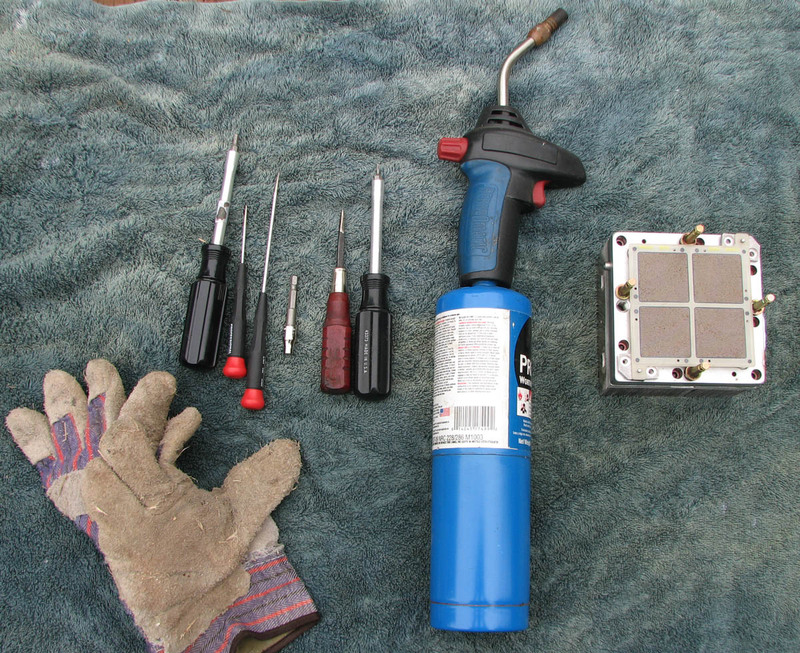 The Gemini was used in many mobile, and rugged PC applications such as the Motorola MW520 Computer used in many police cars. 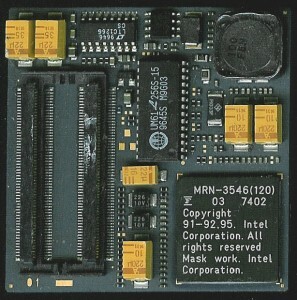 Fujitsu also made modules using Intel dies. These were again used in rugged PC applications, laptops, and industrial computers.